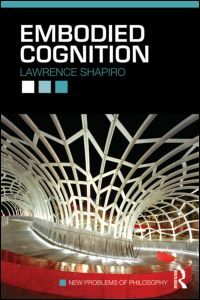 'Embodied Cognition', by philosopher Lawrence Shapiro, is not a book advocating for any particular brand of embodiment. Instead, Shapiro has performed an invaluable service and written an overview of the current state-of-the-art in embodied cognition. The book is thorough, even-handed, and not afraid to highlight key successes and failures of embodied cognition's attempts to take over the world of cognitive science. Shapiro was recently featured on a Brain Science Podcast which is well worth a listen. He can be found online at his website. Shapiro then splits current approaches to embodiment into three streams: the Conceptualisation hypothesis, the Replacement hypothesis, and the Constitution hypothesis. He reviews work in each stream and evaluates each as a challenger to the standard approach separately. the meaning of amodal symbols is grounded in model symbols from our perceptual systems (Barselou, 1999; Glenberg & Kaschak, 2002). In general, Shapiro says, this stream of work does a poor job of competing with the standard approach; many of the empirical results can be readily explained computationally and a lot of the theory hangs on untestable thought experiments about the kinds of concepts spherical beings who live in zero gravity can have. He also reviews some common objections, such as the idea that all these systems still include representations. The Replacement hypothesis comes out as a stronger competitor to the standard approach, but only in a limited set of cases so far (the 'dynamics works for perception action but not language' objection). Shapiro is happy to admit that the 'so far' is an important caveat, but is correct that this is the state of the art today. He then also reviews the challenge from Fred Adams and Ken Aizawa, that this hypothesis routinely confounds constitution with cause and is thus not the challenger to standard cognitive science Clark claims it is. He concludes that the Constitution hypothesis has a lot going for it, is doing quite well in the face of the onslaught from Adams & Aizawa,but isn't necessarily a challenger to supplant standard cognitive science. There is plenty of room here, he notes, for these approaches to work together. Overall, this is an excellent resource and a handy reference for a debate that is happening across multiple literatures (in psychology, robotics, philosophy and more). Shapiro provides a clear overview of the state of the art, and is basically correct in his various evaluations of where things stand. This will stand for some time as a key resource, and I would use the hell out of it as a core text for a course on embodied cognition. I was also interested to note that the research I typically point to as not-really-embodied-cognition does not feature in this book. At best, this work might fit under the banner of the Conceptualisation hypothesis, which does not come out well as a competitor to the standard approach or even as a workable scientific approach. I'm treating this as another nail in the coffin I'm building for this research. I was depressed by one thing in this book: the degree to which vast amounts of embodied cognition work consists of arguing about thought experiments. Does Otto really remember things using his notebook the way Inga does with her brain? Just what would those floating spheres know about 'forwards' or 'up'? What about all those brains in vats and the incredible things scientists can apparently do to them? For the love of science, people, give it up. You end up arguing about the details of things that do not (and possibly can not) exist, rather than the thing we're actually interested in - how cognition is actually implemented in us. Embodied cognition will never get anywhere without working with real systems and figuring out whether they are embodied or extended. "Does Otto really remember things using his notebook the way Inga does with her brain?" It seems like an odd slippage between description and explanation. The question should be "Do both count as instances of remembering?" If so, then "What is happening in those actual situations?" If you get a decent handle on "remember" as a descriptive term, then you can be open to multiple explanations. Of course the process involving the paper works differently than the process without the piece of paper... but you should be able to agree (or disagree) that both are instances of remembering long before you start investigating the processes. As you say, the more interesting question is what actual people actually do when remembering. In that context, one can investigate role of a list. It is scientifically incorrect to ask: "...how cognition is actually implemented in us." without providing the evidential facts that cognition is existent as the Natural phenomenon. So far all scientists ascribing the features of cognition trough the observed acts of behavior, without pointing to the distinguishing properties of that phenomenon. So we could conclude that cognition did not exist, and all discussions about it essentually empty. Agreed. I wrote a post about this awhile back (http://psychsciencenotes.blogspot.co.uk/2010/10/is-it-time-to-abandon-cognitive-non.html). Cognition is certainly not a natural phenomenon and no one has provided a principled way to distinguish the cognitive from the non-cognitive. This is why I advocate being up front about wanting to study and explain behaviour, not cognition. @Sabrina Golonka: Going back to the old S-R, S-O-R debate, are we?